But where were they found? The BBC won't say. When Doctor Who first broadcast back in the 1960s, the BBC had little idea what it had on its hands and, as it needed archive space, many of the older episodes were wiped clean so the tapes could be reused. This included many of the episodes with the second Doctor, Patrick Troughton, but now - thanks to a lucky find - two Troughton episodes are to go on sale this week via iTunes and other digital platforms, and more may come later. No, we don't know when later is, nor do we know how many are out there. We don't even know which Troughtons will go on sale. "We cannot confirm any new finds," says the BBC. Even the source of the episodes is shrouded in mystery. There's long been rumor of a hoard of old tapes kept out in Africa, as part of an electrical engineer's collection. Back in the day, when several African nations were part of the British Commonwealth, BBC shows would have been sent out to all the local television stations, and apparently the unnamed engineer had a habit of keeping the tapes after broadcast. But the BBC is keeping its mouth shut, for now. 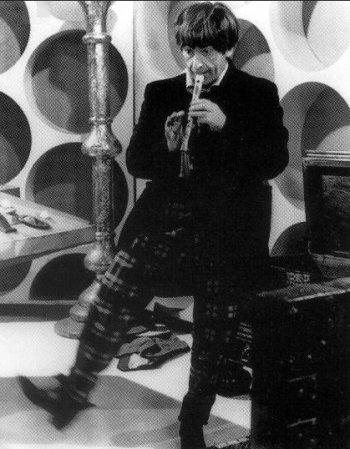 Troughton was a fantastic character actor who, when the show was on the air, refused to give interviews. "I think acting is magic," he said. "If I tell you all about myself it will spoil it." He played the part as a cosmic hobo, wandering time and space, and after the show was done went on to a career in fantasy and horror films, as well as many television appearances. He died in 1987 of a heart attack, while he was attending a science fiction convention as an honored guest. He was 67 years old.